Keith Fleming’s side had to come from behind on a couple of occasions to seal a narrow win in Wales as the current domestic champions maintained their control at the summit. Met’s loss keeps them third in the table while Northumbria University advanced into the top four after a victory over Loughborough University. At the wrong end of the division, Cardiff University picked up a vital win against the University of Bath to move out of the relegation zone. Alun Wyn Davies’ side are now four points clear of Nottingham Trent University, who weren’t in action this week as their fixture with Hartpury was postponed due to the recent bad weather. Leeds Beckett University’s clash with Durham University was also called off and that was a theme across a number of our BUCS matches this week. However, below is a round-up of all the action from BUCS Super Rugby plus we also review our other selected leagues. Matt Johnson’s try in the final 10 minutes was enough for the University of Exeter to claim a hard-fought win over Cardiff Met University. Despite fighting back from a half-time deficit after tries by Pierre Thompson and Rory McMeikan, Exeter trailed 26-20 with 15 minutes left. Shawn Howard’s effort did put Cardiff Met back in front, but Johnson’s score late on gave Keith Fleming’s side the narrow victory which leaves them five points clear at the top of BUCS Super Rugby. The hosts had led 14-6 at the break as Laurie Essenhigh and Luke Northmore both scooted over, with Sam Morley landing two penalties for Exeter. Thompson gave Exeter the perfect start to the second half, but his try was quickly cancelled out by Tom Benjamin and the same scenario occurred shortly after. McMeikan’s score from close-range was matched by Howard, but Met had no answer to Johnson as he powered over on 73 minutes and Morley kept his cool from the tee to clinch the win. University of Exeter Director of Rugby Keith Fleming: “It was a good win. It was two good sides really battling it out. We held most of the territory and possession. I’m a little disappointed in a few areas where we didn’t convert that pressure into points more often than we did, but the boys showed a lot of character tonight and really dug in. Man of the Match Rory McMeikan: “We know coming down here was always going to be tough. Personally, I have been out for a while so it’s good to get back into it with the physicality. We isolated that before the game and we wanted to highlight fronting-up because we know we can match that. It was great performance. Northumbria University clinched an excellent away victory over Loughborough University to extend their unbeaten run to three matches. Yaree Fantini’s second score just before half-time gave the visitors a 19-0 lead with James Elliot also dotting in the first period. Loughborough responded after the interval following a penalty try, and a score from close range on 68 minutes set-up an intriguing finale. 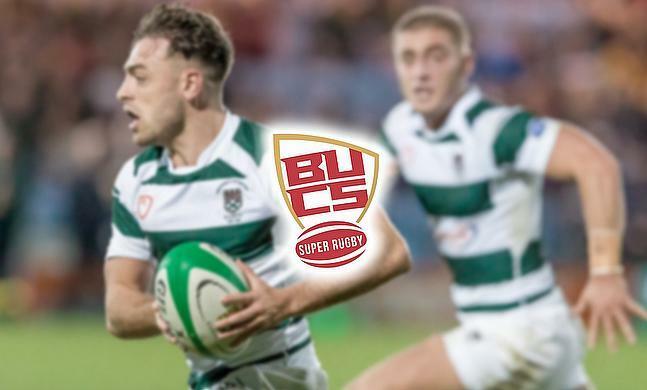 However, the hosts couldn’t take advantage of a yellow card to Northumbria as Darren Fearn’s side held out for the win to move into fourth place in BUCS Super Rugby. Cardiff University survived a late University of Bath fightback to move out of the relegation spot in BUCS Super Rugby. Rhodri Wall crossed in the corner for Cardiff, who were then pegged back just before half-time as Bath went over. Both sides exchanged scores following the restart - with Owen Williams dotting down for Cardiff -before the hosts pulled away after a try from a scrum as well as George Thomas’ effort. Bath responded yet again with two tries of their own, but it was only enough for two bonus-points as Alun Wyn Davies’ side sealed a superb victory. After Northumbria University’s victory against the University of Birmingham last week, Durham University responded by moving back to the summit of Premier North after a 69-5 win over Newcastle University. Durham are now one point clear having played a game less than their title rivals. The University of Exeter continued their momentum in Premier South with a 22-10 win against Cardiff Met University. Jo Yapp’s side are now 13 points clear while Hartpury’s match with Oxford University was postponed. With the University of Newcastle’s fixture with the University of Nottingham postponed and Bishop Burton College v the University of Edinburgh also called off, there were just two games in North A. Second placed the University of Birmingham reduced the gap to leaders Newcastle down to 12 points after a 38-31 win away at Loughborough 2nds. Elsewhere, there was huge victory for the University of Leeds as they scored with the last play of the game to beat Durham 2nds 27-26. The result for the Yorkshire side also lifted them off the foot of the division. The University of Glasgow are now only two points behind leaders the University of Sheffield after a cracking 46-14 win over Leeds Beckett 2nds. The Scottish outfit also have a game in hand over the table toppers after Sheffield lost 28-19 against the University of Strathclyde. Elsewhere, the University of Stirling v the University of Manchester was postponed. The University of Bristol defeated the University of South Wales 24-20 as Ryan Pietersen’s men stretched their winning run to four matches. Meanwhile, Bath 2nds hammered UWE 60-14 to pick up their first victory since November. St Mary’s University made it eight wins in a row in South B as they beat Cardiff Met 3rds 50-19, but title rivals Exeter 3rds remain level on points with the table toppers after a 17-13 win over Hartpury 3rds. Both fixtures in Scottish 1A between the University of Aberdeen and the University of St Andrews + Aberdeen 2nds against Edinburgh 2nd were called off. The University of Liverpool capitalised on Manchester Met's postponement as they beat the University of Hull 41-7 to move into second place in Northern 1A. Rivals MMU saw their fixture called off against Newcastle 3rds which also allowed Newcastle 2nds to extend their advantage at the summit to six points after collecting a 17-11 win away at Durham 4ths. Both games between Keele University and Lancaster University plus Liverpool 2nds v Sheffield Hallam University were postponed in Northern 2A. In 2B, one game went ahead and Northumbria 2nds moved a step closer to the title after thrashing Sheffield 2nds 67-0. The North-East side are 19 points clear of theie nearest challengers the University of York, but the latter have five games left to play. ?? || Different year! Same team! Nothing changes! @NorthumbriaMRU M2 are travelling back from Sheffield with an almighty victory! In the top of the table clash in Northern 3A, Liverpool John Moores University beat the University of Chester 20-0. Their lead at the summit is now four points while in Northern 3B, Sheffield Hallam 2nds picked up a crucial 10-0 win against Newcastle 4ths to increase the gap between themselves and the bottom of the table to seven points. York St John University v York 2nds and the University of Huddersfield against Leeds 3rds were both called off. The University of Warwick’s lead at the top of Midlands 1A has been cut to five points after the league leaders lost 24-22 to the University of Leicester. Second-placed Harper Adams University took advantage with a 23-7 victory against Oxford Brookes University while Nottingham Trent 2nds v Loughborough 3rds was postponed. In Midlands 2A, the University of East Anglia made it eight wins on the spin as the league leaders beat Birmingham 3rds 29-5. Meanwhile, Nottingham 3rds v Nottingham Trent 3rds was called off.